Li, originally from the Canton region in China, moved to the neighborhood at the age of two with his family, and still lives there today. He recalls navigating the streets as a child, and the less-than-friendly encounters that he experienced being visibly Chinese. Now, Li lives in a very different Bridgeport. The neighborhood has undergone dramatic demographic shifts in the last two decades, moving from a traditionally white European space to one where the largest ethnic population is, according to census categories, “Asian”—an entire continent encapsulated in a single label—but, in reality, mostly Chinese. Regardless, the changing composition of the neighborhood is apparent, especially in the storefronts centered on South Halsted Street. It’s at the northern most end of Halsted near 26th Street, about three blocks away from McGuane Park where Li used to play basketball as a child, that his new restaurant, Taipei Café, is located. It’s part of a growing crop of Chinese restaurants that have emerged in Bridgeport, offering more diverse food options when it comes to Chinese cuisine. Taipei Café, which opened in January this year, is only one of a handful of places in the city offering food from the island-nation of Taiwan. Taiwan is best known for its innovative street food that’s served from vendors at its many night markets. It’s the kind of casual cuisine that Li has sought to emulate at his café. Li co-owns the restaurant with at least five other people, some of whom are Taiwanese. Before they opened it, they traveled to Taiwan and methodically ate their way through four different cities (including Taipei), trying to get a broad sense of what dishes were most popular in the country and would work best at their soon-to-be-opened restaurant. They were also trying to hire chefs from the country itself to helm the new venture. Instead, what Li and his team of chefs have on the menu are Taiwanese favorites, ranging from popular street food to hearty home-style dishes: oyster omelet, a starchy mixture of eggs and fresh oysters topped with coriander and a sweet-sour orange sauce; crispy fried chicken dusted with plum powder; braised pork over rice served with pickled radish and cabbage; spicy beef noodle soup topped with scallions; and pork belly buns served Taiwanese style, with crushed peanuts and pickled mustard greens falling off the plate. The restaurant serves Taiwanese shaved ice, a dessert made from shaving thin layers off a frozen block of flavored milk, piling those shavings on a plate, and then topping it with a variety of fresh fruit, sauces, beans, and more, depending on the particular flavor that’s ordered. Its texture is like aerated ice cream. So far, the restaurant has stuck to its guns, keeping as close to authentic Taiwanese cuisine as it can, but Li recognizes its attitude has to be flexible for the business to survive. “We try to cater also to the Chicago people, and Bridgeport has a lot of families. It’s family-oriented right? A lot of good schools here, so it’s family-oriented. It’s not like Roscoe Village or the West Loop where there’s only couples. So we want to incorporate some entrees in our next menu,” he says. He talks about ramping up the menu to make it more family-friendly for Bridgeport residents, but draws the line at altering the kind of cuisine that’s served. It’s unsurprising that Chinese food in America is still spoken of in terms of dishes like orange chicken and chow mein. American-Chinese cuisine, first invented by nineteenth century Chinese immigrants who came to work in the mining and railroad industries, was developed by adapting Chinese regional cuisines to American tastes. 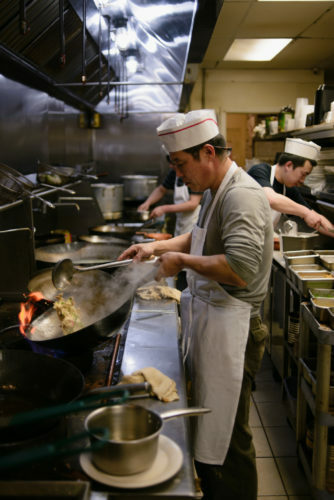 Because most early Chinese immigrants were from Cantonese-speaking regions of China, early American-Chinese cuisine was characterized by Cantonese or Cantonese-derived food. This particular Southern region of China, centered on Guangdong province, thus grew synonymous with “Chinese food” in general, though restaurants like Li’s Taipei Café, and, just down Halsted Street, Northern City, are part of a wave of new establishments changing that view, introducing variety to what we know of as “Chinese” food. Owned by partners Jack Chen and Wang Chen Hai, Northern City on 31st and Halsted specializes in, as its name suggests, Northern-style Chinese cooking. It’s one of three restaurants in Bridgeport, including Potsticker House and Homestyle Taste, offering the regional style. Wang, who is originally from Liaoning province in the North of China, tells me that he first arrived in America in 1999, though he didn’t immediately settle in Bridgeport. “I was in the south of Illinois, near where the border crosses with Kentucky, Missouri and Indiana. It was a little town there, but still in Illinois state. I was working at a restaurant owned by a Vietnamese-Chinese person, and even though it was called Chinese food, it was mostly geared towards American tastes. I worked there for seven years, and only moved to Chicago in 2006,” Wang says. 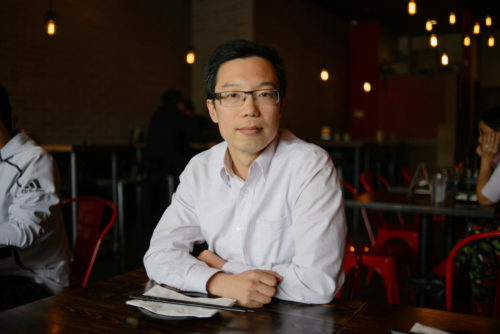 He explains that in the early 2000s, restaurants in Chinatown in Chicago were still predominantly Cantonese—dim sum joints serving dumplings and steamed buns in wicker baskets, and restaurants displaying their roast meats in the shop front window, while featuring double-boiled soups and rice congee on their menu. There simply wasn’t a place for Northern Chinese food, nor any interest in it. “Back then, there just weren’t that many Northeastern Chinese immigrants. And those that were in America didn’t have the means to open a restaurant,” Wang says. In just ten years, however, that seems to have changed significantly. For Jimmy Li especially, a Cantonese-Chinese immigrant, the shift in the kind of Chinese immigrants that are now moving to the Chinatown and Bridgeport areas is apparent. “There are more Mandarin-speaking people now. Usually, mostly, it was Cantonese…and they’re all shifting west, because old Chinatown is overpopulated, and there are only so many buildings in Chinatown. So they’re all moving west, so [the] McKinley and Brighton Park area. And housing is a lot cheaper over there. It’s much more affordable,” Li says. Wang is part of this newer Mandarin-speaking wave of Chinese immigrants that Li speaks of, representing and asserting a different kind of Chinese cuisine and culture, and expanding notions of what it means to be “Asian” or “Chinese” in Chicago. When he finally made the move to the city, it was to work as a chef at a restaurant in Chinatown—one that, finally, served Northeastern food. The region’s cuisine, as Wang describes it, is one that has its basis in adaptation. He tells me that there isn’t really one cohesive notion of what Northeastern cuisine is, but is rather, one that takes from the tradition of braised foods from Shandong province and incorporates local ingredients and methods of cooking. The region of China that Wang hails and cooks from is geographically sandwiched by Russia and North Korea, and lies just east of Inner Mongolia—fertile ground for a cross-cultural cuisine to develop. The climate of harsh winters meant that Northeastern food grew to rely heavily on preserved foods; pickled vegetables like cabbage and braised meats that are cooled, stored, and ready to eat throughout the winter. Wang introduces two quintessentially Northeastern Chinese dishes that the restaurant serves: stewed chicken with mellea mushrooms and blood sausage pork belly soup. The former would be an otherwise generic dish were it not for the golden-yellow fungus that’s used. The mellea mushroom, Wang explains, is found in the mountainous wilderness of the three Northeastern provinces. “It’s entirely wild. Black fungus, shiitake mushrooms, other fresh mushrooms…they can all be grown. This kind of mushroom, the mellea mushroom, can’t. It has a history,” Wang says. To remedy the situation, he prepares dishes with authentic Northeastern cooking techniques, and he makes a significant number of secondary ingredients like the blood sausage, dumplings, and all bread items by hand. He’s particularly proud of his blood sausage production, claiming that Northern City is the only restaurant in Chicago to make and serve this particular variety of Northern Chinese sausage. Above all, he says, what he’s trying to achieve with his Northeastern Chinese food is to preserve a taste of home. A lot of his customers are Northeastern Chinese people, some immigrants and some students from the nearby Illinois Institute of Technology. What they want when they enter the restaurant, he says, is food that tastes of the familiar. “Northeastern Chinese people like to eat Northeastern Chinese food. But you know, not just Northeastern people, but no matter who you are, you can’t escape missing that taste of home. So we try our best to recreate that taste, to keep that taste,” he says. 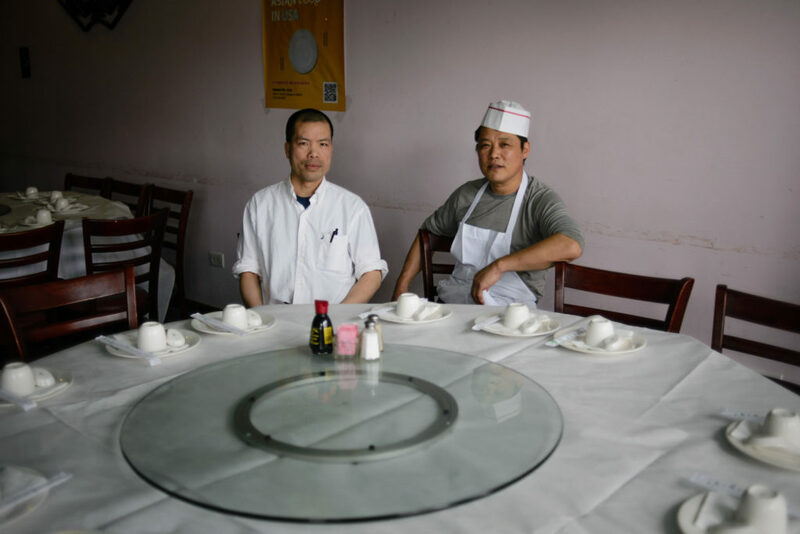 While Li and Wang’s restaurants represent the increasingly varied homelands of a growing population in Chicago, it has been, and still is, painted in broad brushstrokes under a single continental category—“Asian”—in official national surveys and censuses. Armed with woks, plum powder, and blood sausage, however, these new styles of cooking are paving a culinary way for new notions of what “Chinese food” or “Asian food” is, and, perhaps more importantly, who “Chinese people” or “Asian people” are. For in addition to Taipei Café and Northern City, a number of even more varied restaurants serving everything from Korean barbecue, Northern Indian cuisine, and Thai food, have moved into the neighborhood. Bridgeport, where increasing numbers of storefronts now boast non-English signs, is perhaps a surprising neighborhood for such new understandings to take place, given its history. In the 1960s, neighborhood residents rioted and destroyed the property of two Black students who moved in up the street from where the Daley family house is, and in 1997, the beating of Lenard Clark, a 13-year-old African-American boy, by white teenagers from the neighborhood was the subject of outrage. The neighborhood was painted as one that was hostile to minorities, a bastion of white racism on the South Side, and yet, now, according to Li, the neighborhood’s shifting demographic is tangible on an everyday level. He talks again of McGuane Park and how it differs from the McGuane Park of his childhood. “When it’s 9 p.m. and you’re playing ball there and you feel safe, you know the community has become a lot better. When you were younger, playing ball at McGuane at 9pm [was] not a good thing. Because you can get robbed or get beat up there. But now it doesn’t happen there anymore,” he says. Yet, it’s important to keep in mind the distinct differences between ethnic minority communities in the neighborhood before Bridgeport is touted as an example of a successfully integrated and multicultural space. Because although the “Asian” population has seen significant increases in the last three decades or so, other minority populations like the African-American community remained less than three percent of the Bridgeport population even in 2014. Bridgeport’s growing diversity then, is of a very specific sort—it now seems to have a growing receptivity for Asian minorities, due in no small part to its proximity to the nearby Chinatown area, serving as an expected geographical overflow area for an “overpopulated” Chinatown, but also perhaps the more insidious belief of Asian minorities as a “model minority.” The “model minority” myth, which first came into public awareness in the mid-1950s and 60s, portrayed Asian minorities as “industrious, law-abiding citizens who kept their heads down and never complained,” according to Jeff Guo of the Washington Post. Their socio-economic success was often used as an argument against the fight for equality by other minorities, framed in terms of “If they can do it, why can’t you?” Besides the fact that such questions ignore deep-seated structural roots of racism that impede upward mobility for minorities, they also conceal a larger problem of racial inequality by focusing on the successes of one minority population If we read the gleaming storefronts in Bridgeport with their Chinese characters and believe that the neighborhood has now become an example of integrated diversity, we threaten to do the same. The new Asian-owned establishments that pepper the streets around South Halsted may hint at larger cultural and demographic trends in Bridgeport. But ask Wang or Li about the abstract cultural stakes of their restaurants, and you’d be met with confusion. For Wang, his and fellow immigrants’ decision to settle down in Bridgeport was, and is, deeply personal. “People move because of their livelihood, they want a better quality of life for themselves. That’s all I can say. Because America, compared to other countries, the quality of life that people can have here is good,” he says. At the core of it, Bridgeport residents like Jimmy Li and Wang Chen Hai are carving out better lives for themselves in these new communities. In their kitchens and in their new restaurants, their daily labor—slicing, dicing, frying, boiling, steaming, serving, and so on—are the actions that sustain their presences in these neighborhoods. They’re building the small corners of Bridgeport that they can call home, and with each day and each dish, slowly reshaping a neighborhood.